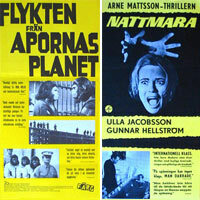 Enormous collection of movieposters in Swedish at Nordic Posters. Fortunately with a good search engine at your service. Try it; bronson, apes, skräck. They also have a collection of really old advertising posters. Here’s a bonus link to the greatest movie title designer of all time; Saul Bass.